The club offers a wide range of training opportunities from Junior introduction to sailing through to Day Skipper (theory). 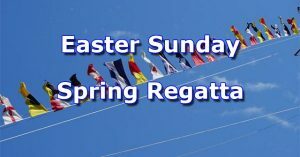 The training programme is set at the beginning of the sailing year and updated regularly on the web site so take a look at what is available in the Calendar. Shotwick Lake Sailing is a RYA (Royal Yachting Association) recognised training centre for windsurfing, dinghy sailing and power boating. Beginner courses are offered to non-members of the club in windsurfing and dinghy sailing. 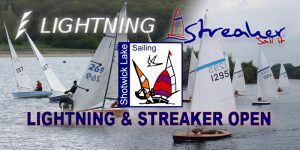 Shotwick Lake Sailing is an RYA recognised training establishment for tuition in Windsurfing. We are currently able to offer the ‘Start’ course for adults and Junior Levels 1 & 2, and hope to be able to offer Intermediate coaching in the near future. For specific details of windsurfing see the windsurfing page on the web site. We often arrange visiting class coaches to improve the racing and boat tuning skills. 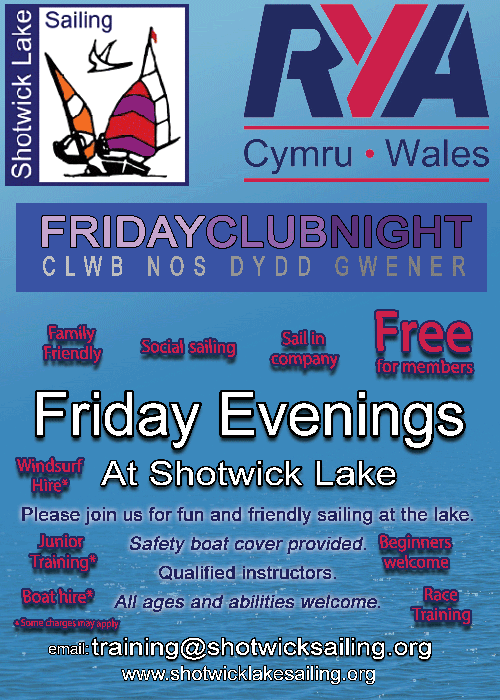 Sail in Company at our Club Night every Friday from the beginning of May with supported sailing. In addition to the RYA Start Racing course we also offer introduction to racing sessions for club members this is for members with some sailing experience who would like to race but don’t know where to start. It is more relaxed than the Start Racing course. The training calendar gives details of when these are scheduled but please contact Tim: training@shotwicksailing.org if you would like to attend. During the winter months we have been holding Open training for our junior sailors they have been practising various boat handling techniques and tactics. Now the Sunday racing has started you may have met them on the start line! Formal training under the clubs RYA (Royal Yachting Association) recognition, primarily targets introducing people to the basic skills of sailing as well as some further advanced courses. What does RYA recognition mean? It means that you can expect to be taught by an experienced instructor aboard a seaworthy, safe, well maintained and suitable craft, on courses within the RYA’s proven training schemes at the supervision ratios defined by the RYA. Qualifications earned on RYA courses are recognised and valued in most parts of the world. All the instructors are volunteers and have a genuine interest and enthusiasm to pass on their knowledge and skills to others. The club is inspected regularly to ensure that training craft and instructors meet the high standards of the RYA. The RYA also carries out spot inspections during courses to ensure the level of tuition and the condition of the equipment remains consistently high over time. The RYA is responsible for administering the recognition system and ensuring standards of training are maintained. The club has RYA recognition for a number of dinghy sailing and powerboat courses as detailed below. The RYA’s National Sailing Scheme is a series of courses for those wanting to learn in dinghies. It has been designed to help you enjoy whichever aspect of the sport of dinghy sailing appeals to you whether pottering, cruising or racing. We organize junior & youth beginner sessions in May and June each year. The format, content and delivery follows the guidelines laid down by the RYA. The sessions run over four evenings giving a total of 8 hours training. 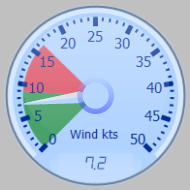 These sessions are aimed at beginners and at the end of the sessions the sailors should be able to sail in light winds. The sessions are also open to non-members and for sailors from the age of 8 years upwards. We use our Optimist or Topper dinghies (depending on age / weight). We are an RYA Champion Club. This is awarded in recognition of the quality and accessibility of our Junior Sailing Program. In addition to the ‘summer training’ we also provide ‘winter training’ in conjunction with the Welsh Yachting Association. This runs in January, February & March since club racing and open events generally run March to December. 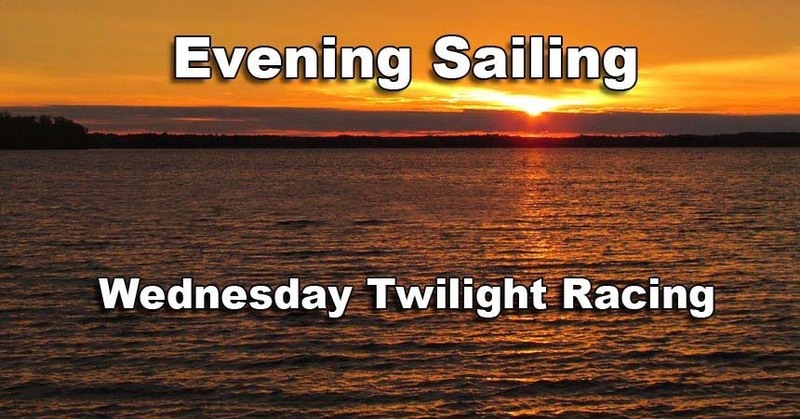 The best way to improve your sailing is to practice so Juniors are encouraged to join our Club NIght and to take part in the normal racing sessions. We organize adult RYA Level 1 and 2 courses in May and September each year. The format, content and delivery follows the guidelines laid down by the RYA. The sessions run over three evenings and five Saturdays. 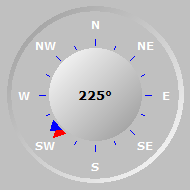 These sessions are aimed at beginners and at the end of the sessions the sailors should be competent to sail in light winds. The sessions are open to non-members of the club but we hope you enjoy yourself so much you will want to join us! We also offer shorter beginners courses during the summer months. The adult courses use our Wanderer and Topper dinghies. Training in one of our brand new Wanderer dinghies. Club members have opportunities to gain Powerboat qualifications. The space on these courses is limited and is focused on developing people to assist with dinghy training and club race management / safety. Demonstration of Man Over Board recovery techniques The course generally undertaken is the RYA Powerboat Level 2 National Powerboat Certificate. In addition to covering the requirement of the syllabus we also cover club specific requirements such as launching & recovery from the safety boat garage, club fuel storage, the use of radios and recovery of persons from the water.